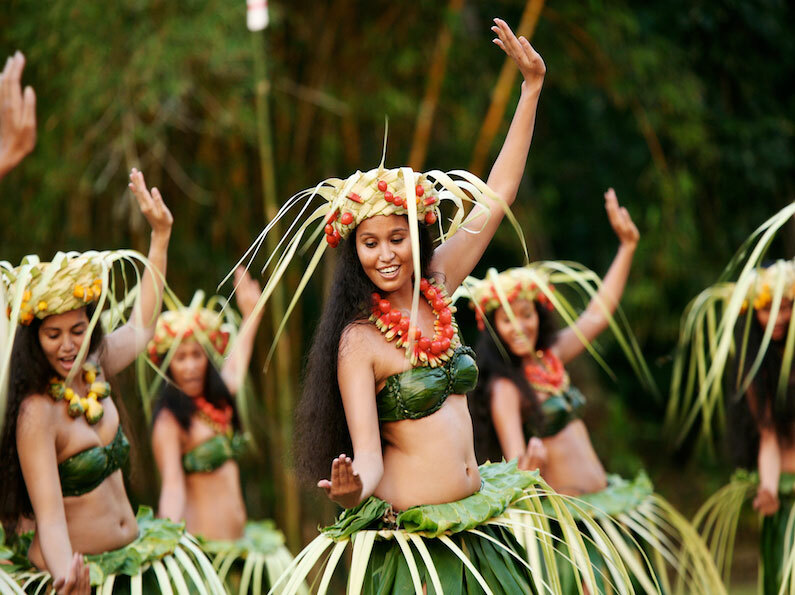 Traditional Tahitian dances have miraculously survived various successive adverse contexts. Dances got soon forbidden ; this because in the perception of the missionaries, they were evidencing and demonstrating far too unambiguously and far too strongly the cultural and societal fact of an absence of taboos related to body and sexuality. When the France of the July 1830 Monarchy took possession of the country in 1842, it adopted a more liberal position: The colonial administration authorized the tribal dances, while censoring the most liberated forms of choreography (of which especially the “upa-upa”, ritually danced by couples in a manner that was too explicit in the light of the criteria of French morality, at the time). The advent of the first Tiurai festivals from 1881 onwards allowed Tahitian dances to survive in the annual setting of these festivities initially designed by Queen Pomare IV to bring together metropolitan and local cultures. But for the Tahitian dances, it was only a respite, for new dangers began to threaten them, especially by the end of the fifties… Dangers that to be less evident than previous religious interdicts had formerly been, were no less formidable: Coming first in the top three of risks, the consumer society with its enormous power to destroy cultures, folklores and ancestral arts. In the second place, the opening of Tahiti and its islands to the big world via the maritime links and the first air links. This connection with the world had introduced new tastes, new musical styles and new dances which had contributed to a certain neglect of the traditional art of “ori tahiti” … But the third danger was surely the worst: For years, the Tahitian dances had shown a propensity to somehow “withdrawing into themselves”, to the point of involuting. Dances were involving only island communities or some districts of the island of Tahiti, being never or too rarely the “must see” or the “highlight” in any “general public” representations. It was in 1956 that Madeleine Mou’a, a Tahitian school teacher, became aware that the position of the Tahitian dances had got extremely precarious, realizing also that their time was counted if nothing was done timely to bring dances back to light and even to promote them … The late fifties have in many respects, been the years of a strong revival of the Polynesian cultural consciousness. This context certainly contributed to making the local minds more receptive to the message Madeleine Mou’a was so keen on addressing to the Polynesian cultural identity by bringing the dances back… The context did help, but it did not do the job. On her return to Tahiti, Madeleine Mou’a created a dance group that she called “Heiva”. Success grew from year to year. The ballets given by “Heiva” at the Tiurai dance tournaments forced the admiration and even the emotion of all. These ballets addressed to all Polynesians the message of a new cultural dignity and identity. In a few years, Madeleine Mou’a became the “high priestess” of dance, endeavouring to rediscover the fundamentals of the original tribal dances and to preserve them, while adding the candid grace and refined elegance of her own choreographic creations. Nietzsche said: “Anything that does not kill me makes me stronger”… The analogy with the destiny of Tahitian dances is tempting, as it is true that what should logically have made them disappear has finally made them stronger, more dynamic, more radiant and more creative … But without Madeleine Mou’a, the dances would surely have sooner or later been “killed” by what had to do it… Thank you Madeleine!